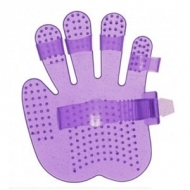 Flexible Polymer Impact Shield wraps around tendons and ligaments for ultimate injury protection. Engineered with a Dynamic. 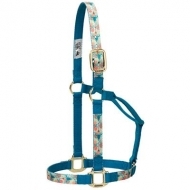 Sling System for superior support and protection. 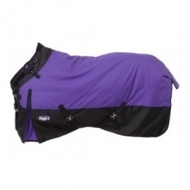 Breathable foam construction protects legs while offering freedom of movement. 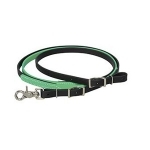 Premium elastic excels at keeping out dirt and debris without cutting off circulation. 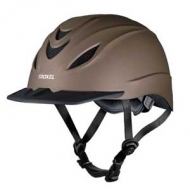 Ideal for the performance horse. Our research and development team went above and beyond to ensure that Prodigy® Athletic Boots were designed just right to ensure a perfect fit and protection for your horse's legs. Built from the finest form-fitting, shock-absorbing memory foam covered in neoprene, these boots help prevent injuries and extend competitive careers. 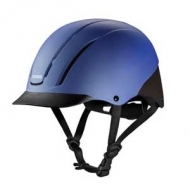 Plus, we added the stretchy binding and darted edges for a secure fit and to keep legs free from dirt even under the most demanding riding scenarios. 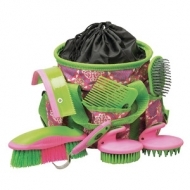 A 7-piece assortment of grooming essentials in a durable nylon tote bag for easy organization and carrying. Tote features six exterior pockets for added storage, a wire-reinforced top for stability, a convenient top drawstring closure, plastic feet that protect bottom of the bag, comfortable webbing handles, and an adjustable, padded shoulder strap. 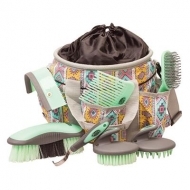 Includes comb, hoof pick, palm held curry comb (65-2058), palm-held face brush (65-2060), mane and tail brush (65-2057), dandy brush (65-2059) and sweat scraper/coarse curry combo (65-2056). 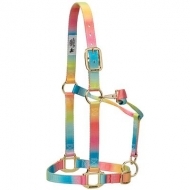 Highlighted with a rainbow pattern that looks great on a wide range of horses. Fashion-forward design made from the finest materials and attention to details. Box-stitching at stress points for extra strength. Rolled throat for your horse's comfort. Brass plated hardware. Fashion-forward design made from the finest materials and attention to details. Box-stitching at stress points for extra strength. Rolled throat for your horse's comfort. Brass plated hardware. 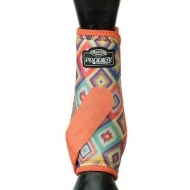 Designed to conform to the palm of the hand to cushion the grip and improve control while rasping. 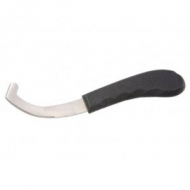 The poly handles grip the end of the rasp strongly and will not fall off. Set includes rasp with rasp handle and tip. Easy to handle. 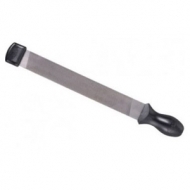 Thick rubber squeegee mounted on plated steel back with wood handle. The blade is 10" long with 7" handle. Assorted colors. The safe efficient way to remove bot eggs. 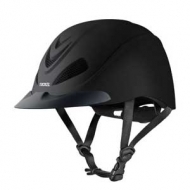 It has no sharp edges to gouge the horse and can be used by the youngest rider with safety. Can also be used to remove old hair, also trim and groom mane and tail. Made of heavy-gauge stainless steel to last a lifetime. Hand shaped curry allows you to scrub around legs and into tight spaces. Loosens hair while massaging horse. 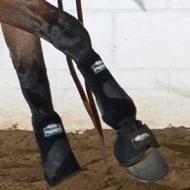 High-performance athletic boots are engineered with a Dynamic Sling System that provides superior support and protection to the suspensory tendons and ligaments. 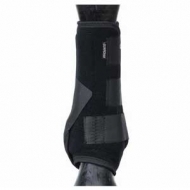 Our research and development team went above and beyond to ensure that both the wrap and sling were designed just right to ensure a perfect fit to the equine leg. We enlisted a variety of industry professionals and a wide range of horses to perform hours and hours of testing to fine tune the design. 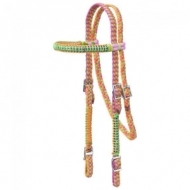 Braided cord browband headstall with Conway buckle bit ends. Features crystal accents on cheecks and brow. 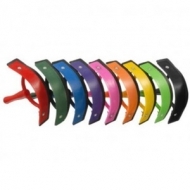 Purple/black, pink/black, turquoise/ black, red/white/blue, brown/tan/black, purple/raspberry, purple/turquoise/ pink, neon rainbow. 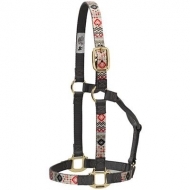 Available in Damask, Navajo, Chevron, and Paisley. 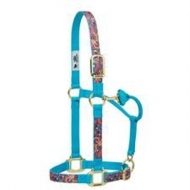 The fashion-forward designs of these halters are made with premium materials and attention to detail such as fashion hardware and colors. Box-stitching at stress points for added strength and a rolled throat for comfort. With a panic snap on one end and a swivel snap on the other, these nylon cross ties are easy to move to different locations. They adjust from 3' to 6'. Nickel plated and chrome brass hardware. Sold per pair. 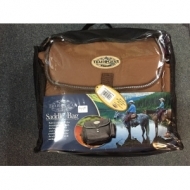 Durable and weather-resistant, this saddle bag is where form meets function. This bag feature adjustable straps for stability and ample room for storage, one with an insulated insert perfect for food and drinks and one with additional interior pockets. 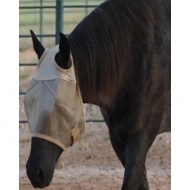 The Econo Fly Mask provides excellent protection on a budget. 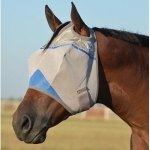 Lightweight mesh material helps reduce sun exposure while keeping insects at bay. There is no way we can repay the debt we owe the men and women who have served in the Armed Forces. In an effort to help those who carry the scars from their service, a portion of proceeds from all blue-trimmed fly masks will be donated to the Wounded Warrior Project. 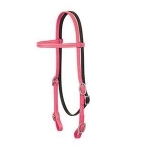 All purpose rein offers the easy cleaning, weather resistance and durability of our exclusive Brahma Webb coated webbing in a versatile design perfect for a wide range of riders. 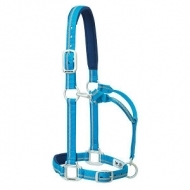 All purpose 5/8" headstall offers the easy cleaning, weather resistance and durability of our exclusive Brahma Webb coated webbing in a versatile design perfect for a wide range of riders.